There are lots of different developers of online casino games on this planet. They can be very different, as you will find once you start playing some of the games that were made by Playson! This company is responsible for a very large number of slots which can be played on many different websites. They may not have the best graphics in the world and they may not even have the flashiest bonus features, but there is one thing that they do offer: re-playability! The Playson slots will grab your attention in just a few spins, after which they will never let you go. So, gamblers be warned: Once you try your luck on the games that were made by this remarkable producer, you might end up changing your list of favourite slots very quickly! There isn’t all that much information that you can find about this particular developer on their website. They are a gaming company with a headquarters based in Malta, and they employ over 250 people worldwide. That would mean they are doing pretty well for themselves. But that is something you can also tell from their news messages, like how they are going to expositions all over the world to showcase their products! 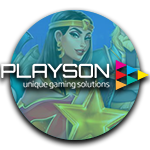 You can find slots and gaming cabinets that are made by Playson in land-based casinos in many different countries after all, which means they are actively present in many different markets. But that isn’t really the thing we’re interested in. Because what we like to see is online slots! Luckily, Playson has digitalised a fair number of its slots, which means you can now try your luck on more than 40 different Omni-Channel HTML5 titles. That means their games run on the latest technology and they are generally also available for mobile devices! While at the same time, they are of course also created with HD graphics! This developer may not have produced as many games as some other brands, like Novomatic and Netent, but that doesn’t really say much. Because let’s be honest, how many slots will you really end up playing in one session? With over forty different titles, Playson has created more than enough material to keep you busy for a while, especially considering the fact that they are all completely different! For example, there are some games which are downright silly, like Zombirthday and Dracula’s Family, while there are also plenty of classic slots to be found in the Playson selection, like Thunder Reels and Fruits ‘n Stars. But those are generally a bit older. This developer has also created some games which are much more modern, as well as a lot better looking. Some of their latest games are as graphically attractive as those by any other brand, while the available bonus features are remarkably original too! If you want to get an idea of what I’m talking about, simply open Legend of Cleopatra, Crystal Land, or Art of the Heist. The last one of those three will put you in the shoes of a burglar called Vincenzo and it will make you want to get away with a big loot. Find your way through the three different floors of the museum to make it to the bonus game. There you can enjoy free spins and if you’re lucky even a secret treasure room! Will you get away scot-free? This (very) short description of the Art of the Heist slot gives you a quick idea of what you can expect while playing the slots that are made by this developer. As mentioned before, they are incredibly well put together, and have the potential to keep you entertained for remarkably long periods of time. If you would like to try your luck on one (or several) of these slots at a reliable online casino then you might want to visit one of the websites that are recommended here. Also, don’t forget that there will undoubtedly be plenty of other Playson slots coming our way in the near future. Because just like any developer, this company is constantly in motion, trying to develop new products meant to impress the general public!